Ta-Nehisi Coates, author of the New York Times bestseller Between the World and Me (Random House, 2015) and National Book Award nonfiction nominee, was on the Howard University campus on Wednesday, October 7, for a full day of interaction with Howard students and members of the Howard community. His visit culminated in a major address and book-signing event at Cramton Auditorium at 7:00 pm. Below is the approximately 90 minute presentation and dialogue with the Howard University community. The one comment I'll share about the occasion is that Ta-Nehisi's thoughtful and insightful reflections, especially evident in his exchange with HU students, is exactly the kind of experience that seems to set the HBCU experience apart from all others. This was a family conversation: one son of HU, Ta-Nehisi, in conversation with a new generation of students, who are similarly finding their path while making sense of this racist world we've all been born into - and one that we're all still seeking to turn right side up. I hope people have some appreciation of how unique and valuable the Howard University experience is, especially at this particular moment in time, spoken from another son of this great institution. If you hear someone question the value of an HBCU experience, especially the HU experience, or next time someone asks such a ridiculous question, just share this link with them. And if you want more of this caliber discussion (including more of the rich and complex history and current presence of African people in the world) with and between students, you should really visit the campus and attend some of the campus discussions related to understanding, and even more so the healing and development of, the world African community. As much as people say violence and civil unrest is counterproductive, the reality is that violence is the language that captures both the attention and the imagination of 'the state'. The media, national and local alike, tend not to pay attention to Black suffering, and certainly don't listen to the cries of Black people, unless there is some level of pressure and disruption to normal societal operations. In the TV One segment below, Howard University professor Dr. Greg Carr discusses the historical context of the Baltimore uprising last week, and the role of violence in capturing the attention of the media and elected officials. 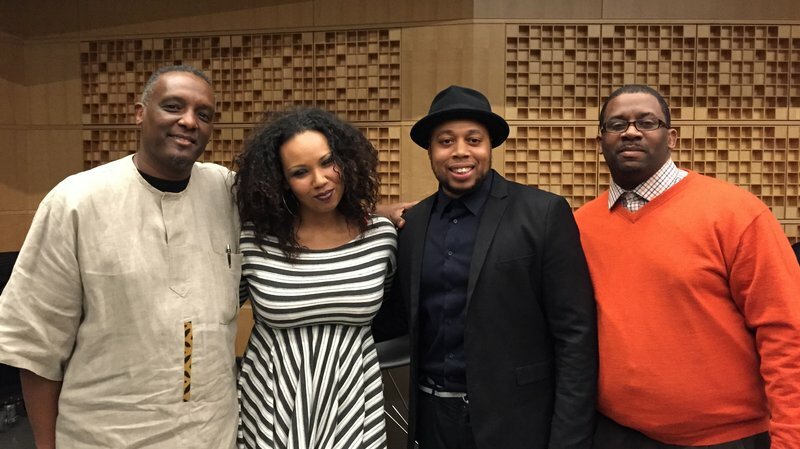 NPR Panel participants (from left to right): Dr. Greg Carr, Jamilah Lemieux, Cedric Shine and K. Nyerere Ture. Photo by Frannie Kelley for NPR. This week, in honor of Black History Month, we went down to NPR's headquarters in Washington, D.C., to screen Sam Greenlee's 1973 film The Spook Who Sat by the Door and host a conversation about its resonance. In case you're not familiar with the cult classic, the main character is Dan Freeman, who's trained by the CIA to be its first black agent. After he masters the agency's tactics, he goes home to the southside of Chicago on a mission to train street gangs to be "Freedom Fighters." When a young man is shot dead by the police, Freeman's trainees spring into action. What happens in the end is open to interpretation, as you'll hear at the start of this recording of our panel discussion. The members of our panel are Dr. Greg Carr, Chair of the Department of Afro-American Studies at Howard University, Jamilah Lemieux, Senior Editor at Ebony Magazine, and K. Nyerere Ture, an anthropologist and professor at Morgan State University. The panel and the audience discussed the film's themes of resistance and intra-racial tension as well as the erasure of the Black Arts movement from mainstream discussion of black history. "The villain of the film," said Dr. Carr, "is the idea of the nation-state." In case you missed it, I wanted to share a really great discussion hosted earlier this afternoon by Brother Marc Lamont Hill on HuffPost Live. The discussion was about the meaning and underlying significance of Black History Month, and also specific figures in our history that don't get as much attention in America's annual February interpretive dance around 'respectable' Black facts and Black figures. One of the most important points I took from this discussion is that our challenge is to take ourselves seriously enough to study, and critically examine, all of the complexity in our long and rich history, beginning many centuries before the invention of a European. Moreover, we have to do this critical study using our own African cultural and historical lens, and not interpreting our experiences over the centuries through a European and/or American historical, cultural and intellectual lens. Each February the nation recognizes the achievements and societal contributions of black Americans. We take this time to remember the invisible heroes of black history who have helped pave the way for equal rights. Should Morrison’s Paper Go To Princeton? The conversation shared below was a very insightful one... about the ways in which people make decisions about what institutions to leave their personal papers with, and more importantly, about the intellectual and cultural vision for HBCUs - both past, present and future. In my perspective, this was one of the richer of the discussions hosted and facilitated by HuffPost Live. Toni Morrison's collections of writings will be permanently housed at Princeton University, but some critics believe the Nobel prize-winning author's papers should live at her alma mater Howard University. Where would they serve more purpose? In the two video clips just below (approx. 11 minutes total) are powerful reflections by Dr. Greg Carr, Chair of the Department of Africana (African American) Studies at Howard University. Dr. Carr's remarks serve as a clear reminder of why places like Howard University exist, and the critically important role of students - at Howard University and at other similarly situated HBCUs - in the continuing struggle for justice for Black folks in the US and throughout the world. We must use all of our creative and intellectual capacity to transform our community! Below is the audio of a lecture given by Dr. Greg Carr, currently the Chair of the Howard University Department of African American Studies. This passionate and comprehensive lecture situates Dr. John Henrik Clarke within the broader context of African intellectuals and activist movements throughout the twentieth century. Much appreciation and many thanks to Brother Jared Ball for posting this presentation at I Mix What I Like. ... a brilliant presentation given by Dr. Greg Carr on the life, history and political/cultural “genealogy” of Dr. John Henrik Clarke at the 1998 (November) gathering of the Association for the Study of Classical African Civilization (ASCAC) at the International House in Philadelphia, PA.